Wild release programs conducted for mussels and manatees. Raising wildlife in captivity and then releasing it to the wild is a technique more commonly associated with land animals, but two recent success stories relate to two aquatic species of very different sizes - tiny mussels and a large manatee. The mussel reintroduction took place in Virginia. Over the past four years, Richard Neves, a professor of fisheries and wildlife sciences at Virginia Tech, has propagated more than a quarter million endangered mussels and returned them to the wild. Saving endangered mussels is vital, Neves says, because mussels are natural biological filters in the river system. They remove sediment, contaminants, and particles, ingesting some and releasing the rest into mucus strings. Some water insects feed on these strings, and the mussels themselves serve as a food source for raccoons, muskrats, river otters, and diving ducks. 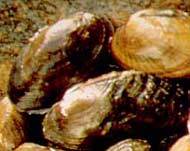 Many mussel species are endangered because of water pollution and disturbance or destruction of their natural habitats. He and his colleagues collect gravid females, using a hypodermic syringe to harvest the larvae. They then deposit larvae onto the gills of the type of fish that particular species of mussel prefers. The larvae, which are parasitic, must attach to fish, from which they extract the nutrients required for them to transform from the larval stage to the free-living juvenile stage. "Each gravid female has from 30,000 to 2 million larvae," Neves says. "In the wild, 99 percent of these larvae never attach to a fish and are wasted." The host fish are kept in holding tanks after they're "infested" with larvae. Carrying the larvae does not appear to negatively affect the hosts. The tiny mussels -- smaller than the head of a pin when they drop off the fish -- are siphoned up and placed into tanks where they feed on algae tailored to meet their nutritional needs. After growing for up to a year, they are returned to the wild to begin their work of improving water quality by filtering sediment and other water impurities. Another recent reintroduction success story involves only one animal, but a much bigger animal - an Amazonian manatee. The manatee, named "Airuwe" by his caretakers, was only a few months old when he became tangled in a net and injured in the Colombian Amazon in 1998. Dr. Greg Bossart, Director of the Harbor Branch Division of Marine Mammal Research and Conservation and an expert on manatees, went to the area shortly after Airuwe was caught, to help establish a rehabilitation program with the goal of eventually returning the manatee to the wild. In addition to the injuries from the net, Airuwe was dehydrated and malnourished, basically "starving to death," according to Dr. Bossart. "They had him in a lake, and we had to get him into a smaller, contained pool of water where people could control his movements and take care of him. He had to be bottle-fed every four hours, and there just wasn't any type of facility there set up to take care of him". That is, until the mayor of the local community of Puerto Narino stepped in. "He had this 500-gallon cistern that gathered rain water, and that was the drinking water for his family. He turned over the use of his cistern for the care of this young manatee, which of course meant his family had to get their drinking water from somewhere else," Dr. Bossart said. The next problem was finding enough people to mount around-the-clock care and bottle-feeding every four hours. At first, the director of the Omacha Foundation thought it would be impossible. That's when the Colombian military became involved, with many soldiers volunteering to help feed and care for Airuwe. For two years, the Foundation and community worked together, eventually moving Airuwe into a larger pool, weaning him off the bottle and onto natural vegetation, and then moving him into a lake. On February 8, 2002, Airuwe was examined by a veterinarian, fitted with a belt-mounted transmitter, and set free in the Tarapoto lake system in the Colombian Amazon. Scientists continue to track the manatee, and Dr. Bossart says it's a success story, not only for the manatee, but also for the community of Puerto Narino, the Omacha Foundation, and the Manatee Outreach Program.